For an exhilarating weekend getaway or a corporate safari adventure, Monate Conservation Lodge, a South Africa safari lodge in Limpopo is the ideal bush break. Families, couples and conference executives looking for a Limpopo safari lodge getaway will enjoy the tranquility, good food and exciting activities at Monate Conservation Lodge. 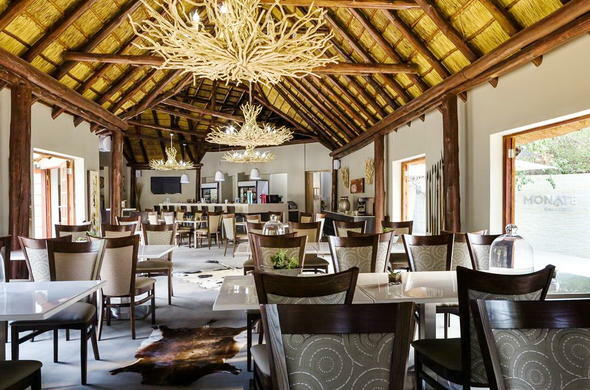 This safari lodge in Limpopo, has a state of the art conference centre which is close to the lodge looking out over magnificent gardens. Monate Conservation Lodge is located on a private game reserve with a variety of game animals including Leopard, Cheetah, Buffalo, Rhino, Hippo, Giraffe and other antelope species such as Kudu and Eland. There is a significant Conservancy nearby with prolific bird life. Professional game drives take place twice a day or guests can go on guided bush walks. A highlight is also the horseback safaris; venturing out to view game in this manner gives a unique perspective on the wilderness. There are 2 lovely swimming pools to choose from and a Jacuzzi as well as a variety of fun sports and activities to keep the young at heart entertained. For those who want to work out there is a fully equipped gym. Great African style food including vegetarian cuisine is served in a number of places including a cave setting or around a roaring log fire under the night sky. A delightful afternoon tea is served in the garden.